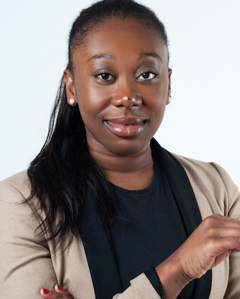 Lucy Larbi is a globetrotter with an interest in development issues for many years, particularly in relation to Africa and its economic recovery. Born in Ghana and raised in Germany, she pursued this goal early on; creating perspectives for people with an African migrant background. After studying in Holland, Tanzania, Madrid and doing internship in Ethiopia and professional experience in Ghana, Algeria and Germany, she founded the German arm of the organization – Future of Ghana Germany in 2016 on appointment by Arnold Sarfo-Kantanka (Founder Future of Ghana). Professionally Lucy works in management consulting and carries out activities in international cooperation. She holds a BA in International Relations from the University of Groningen and a Masters in Political Science from the United Nations University.